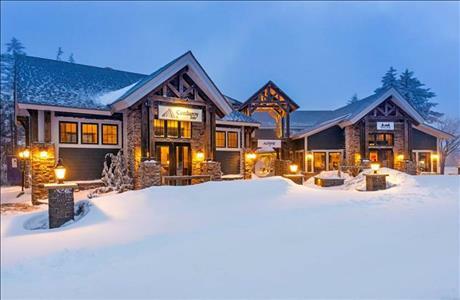 SNOWSHOE'S FIRST & ONLY BOUTIQUE HOTEL Ideally located at the top of the Powder Monkey chairlift, and across the street from Snowshoe's famous Western Territory, the family-owned Corduroy Inn offers upscale amenities to guests in a ski-in/ski-out setting. With its own private hearth room, onsite coffee shop and dedicated concierge staff, Corduroy Inn delivers a high level of service and convenience to its guests. The property features studios, loft, 1-bedroom and 1-bedroom plus loft suites. All hotel rooms feature a modern elegant style blended with the rustic charm of West Virginia. All of the rooms at the Inn have luxuriously appointed bathrooms with heated tile floors, quartz kitchenettes and stone fireplaces. The entire property is WIFI enabled and each room has HD satellite TV. APPROXIMATE DISTANCE TO SLOPES: Located at the top of the Powdermonkey lift adjacent to the Whistlepunk trail and directly across the street from the Western Territory.